The Automotive World’s Most Famous Rectangle… Mercedes-Benz G-Class. Currently soldiering through its 34th year of production, the square-jawed Geländewagen debuted with military aim back in 1979. The handcrafted beast has laughed off a good many predictions of its demise over the decades, most recently last year, right before debuting for the 2013 model year with an array of upgrades and revisions, suggesting that it has no intention of making an exit anytime soon. 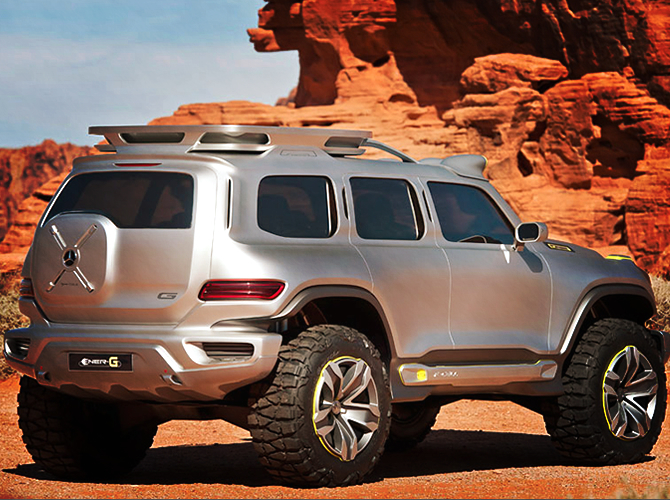 But that hasn’t stopped Mercedes-Benz from imagining the future of the G-Class. 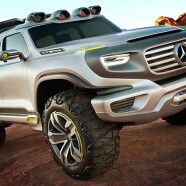 With its Ener-G-Force all-terrain concept, the company offers a dramatic glimpse at a possible sequel for one of the world’s vehicular icons. 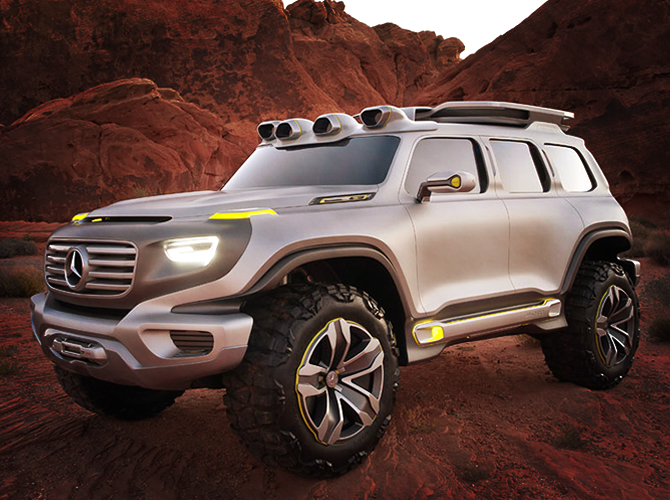 Created to suggest a futuristic law-enforcement vehicle in the annual Los Angeles Auto Show Design Challenge, the Ener-G-Force is jam-packed with futuristic features. It eschews the angularity of the current G-Class for a look that’s decidedly more globular. 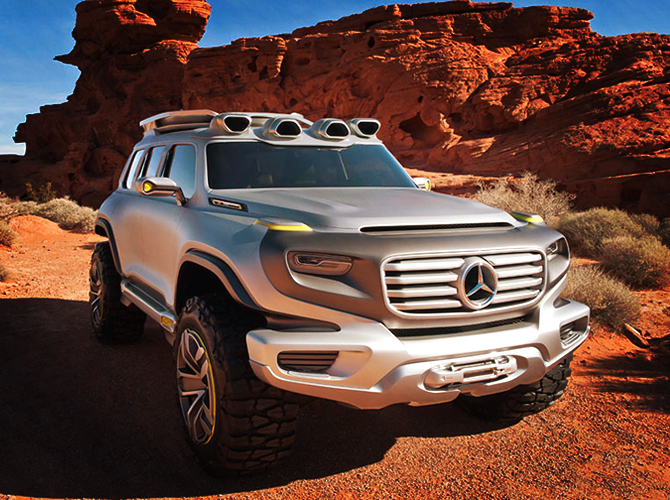 Mercedes insists the off-roader concept “invokes the genes” of the current G-Class, though it does so in a second-cousin-twice-removed kind of way. We see some Geländewagen in the shape of the grille and headlamps, the slot-style taillamps, and, of course, in the fender-top-mounted turn indicators. “Of course we wanted to take a clear step forward, but we also wanted the G’s characteristic features,” says designer Hubert Lee. 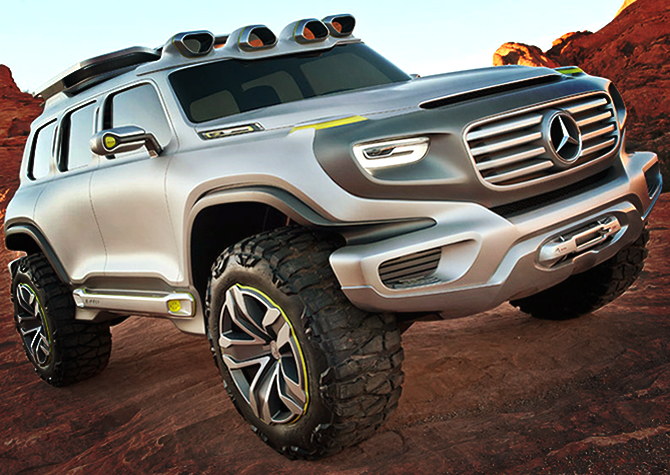 The Ener-G-Force is all about all-terrain supremacy, but the concept approaches this mission rather differently than the current G-Class. Power comes not from a fossil-fuel-swilling internal combustion engine, but from a quartet of wheel-hub-mounted electric motors, juiced by battery packs in the rocker panels, which are charged by hydrogen fuel cells. On the roof, a huge pan collects rainwater and funnels it into a “hydro-tech converter” where it is separated into its elemental parts, which keeps the fuel-cell powerplant fueled with hydrogen and extends the driving range. Easy, right? The theoretical operating range of this system is 500 miles, and the only emission is water. 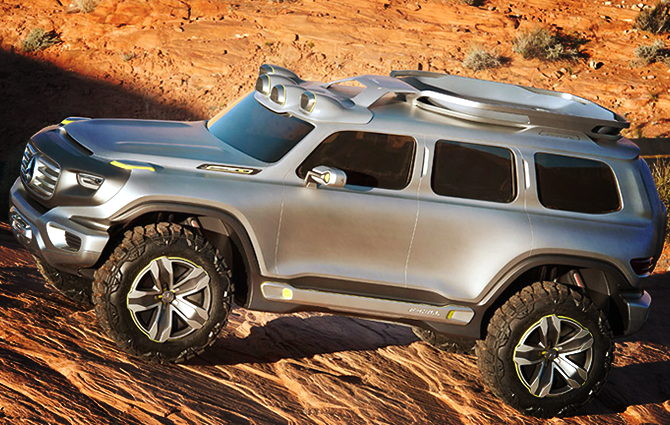 For now, the futuristic Ener-G-Force is just a daydream—albeit an impressively realized one. 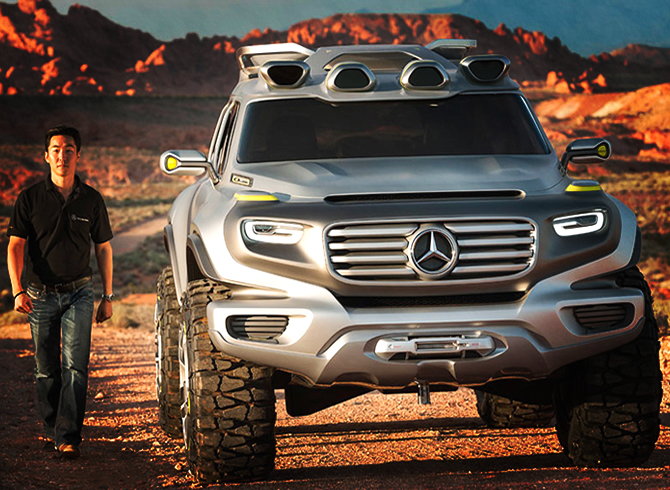 No surprise, Mercedes has made no promises about production, but it’s not hard to imagine at least some of the Ener-G-Force gracing a Mercedes showroom in the not-too-distant future. In the meantime, we still have the classically handsome 2013 G-Class: the standard G550, with Mercedes’s 382 hp normally aspirated 5.5-liter V-8, and the fearsome G63 AMG, with a 536 hp twin-turbo 5.5-liter V-8. They are priced at $113,000 and $134,300, respectively—perfectly fair for a bona fide icon.